At Havana airport, we got through customs ok although they asked us strange questions on whether we had more than one passport. Baggage claim took longer as it was so disorganised. A couple of distressed Russians couldn’t find theirs. There was lost luggage in piles and they kept changing the carousel. Once out our driver took us to our guest house within thirty minutes driving a blue Swiss made Chevy from the 1950s. On the way there, we could see they were on the road everywhere and he pointed out a Buick for Mike once we told him his surname. My first impression of Havana in the Vedado area was that it was similar to some other Latin American cities, a mix of grand houses and apartments in need of repair. My second impression east of Havana Viejo where our friends Monica and Mike K were staying was more a feeling that I had stepped back in time, perhaps to Naples after the war. My third impression of Havana was that I was in Europe surrounded by piazzas and beautifully restored 18th and 19th century buildings. 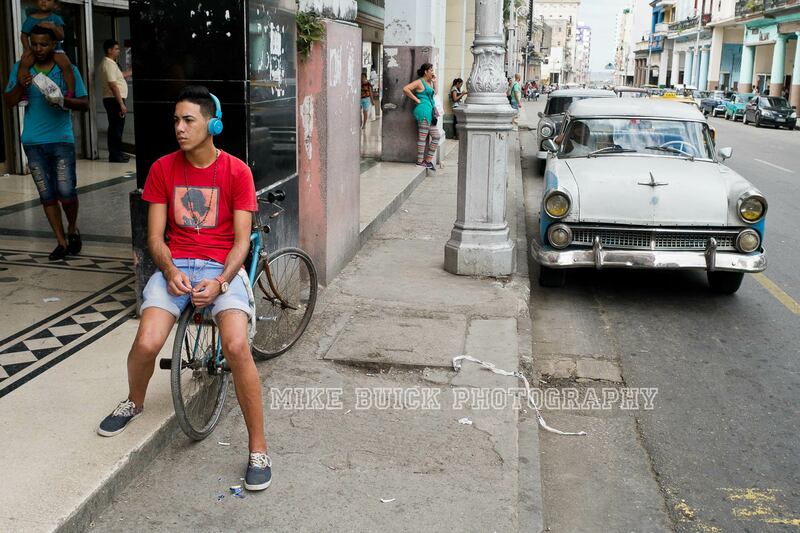 Havana is definitely on the cusp of change. Our guest house was a comfortable focal point at the end of each day. La Colonial 1861 is a beautifully restored white building managed by Armando from Spain. With a cigar in his mouth and a kiss on the cheek we were warmly welcomed and given lots of fantastic tips. The guest house is located in the Vedado area, a quiet area by the Malecon, where the wealthy used to live. We also noticed how Armando cares for a few dogs making sure they are taken for a walk every evening. They look very well cared for more to our welfare standards compared to the poor skinny strays we see. One of the most useful tips Armando gave us was how to get to Havana Viejo like a local. We stand on the corner of the main road, Linea, on the look out for an old Chevy, Ford or Buick. This is different from a taxi which charges more. The driver is on the look out for passengers standing at intersections and if he has room he will stop for you. In response, you check he is going in the same direction as you, in our case Habana, and give him the intersection you want to stop at, usually a calle. This only cost us 1 CUC total for the two of us compared to 5 – 10 CUC for a taxi service – and much cheaper than a tour ride. Beware that some will still try to get an extra buck out of you though so confirm the price before you get in. We were nervous at first but took to it quite easily once we knew it was quite a normal and safe thing everyone does. Plus a great way to travel with the locals. Just one thing to remember is to close the door gently because you don’t want it to fall off and always get out on your right. On our first night here we were excited to meet up with our European friends, Monica and Mike K, and stayed up late catching up with them at a Paladar on the Malecon. In general, a Palador is a restaurant in someone’s home. The Palador Torresson at Ave Malecon No. 27 had tables on their balcony with a view of the Malecon though it’s so dark you can’t see the sea. Not much lighting but we saw an American cargo ship pull out of the bay disappearing into the dark distance. The meals are simple but good, vegetable soup, rice with beans, grilled fish and salad plus the ubiquitous and refreshing iconic drink, the Mojito. I think this is all I’m going to be drinking while I’m in Cuba! On our way back to La Colonial we took a local car again from Neptuno, near the Casa de la Musica Habana where there was a queue of beautiful young things, some transvestites, ready to salsa dance all night from 11pm to 5am, obviously the place to be seen if you’re a local. In the Vedado area young things queue up for the Fabrica de Arte, one of Armando’s favourites and a more contemporary musical scene. Both are pricey if you’re on a budget and especially if you’re a foreigner where everything is double the price!